To see the economic development of the country. To assess the developmental objectives. 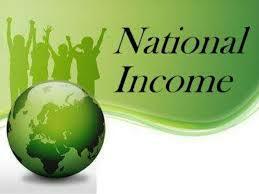 To know the contribution of the various sectors to National Income. Internationally some countries are wealthy, some countries are not wealthy and some countries are in-between. Under such circumstances, it would be difficult to evaluate the performance of an economy. Performance of an economy is directly proportionate to the amount of goods and services produced in an economy. Measuring national income is also important to chalk out the future course of the economy. It also broadly indicates people’s standard of living. Income can be measured by Gross National Product (GNP), Gross Domestic Product (GDP), Gross National Income (GNI), Net National Product (NNP) and Net National Income (NNI). In India the Central Statistical Organization has been formulating national income. However some economists have felt that GNP has a measure of national income has limitation, since they exclude poverty, literacy, public health, gender equity and other measures of human prosperity. Instead they formulated other measures of welfare like Human Development Index (HDI). The National income measures the flow of goods and services in an economy. Note: The National income measured only on flow and not on stock. The National income measures of net volume of goods and services produced in a country during a year. It also includes net earned foreign income. The National Income is counted without duplication. The National income measures the productive power of an economy (flow). The National wealth measures the stock of commodities held by the nationals of a country at a given point of time. The National income estimates are in relation with the financial year. In India the financial year begins on April 1 and ends on March 31. No specific attempts were made.The 1st attempt was made by Dada Bhai Naoroji (Grand Old Man of India) in the year 1868 in his book ‘Poverty and Un British Rule in India’.He estimated that the per capita annual income as Rs. 20 per annum. Other estimators William Digby in the year 1899, Findlay Shirras in 1911, 1922 and in 1933, Shah and Khambatta in 1921, V K R V Rao during 1925-29 and 1931-32 and R C Desai during 1931-40. The above people estimated the national income with the value of the output of the agriculture sector and then added a certain percentage as the income of the non-agriculture sector.The estimates suffered with serious limitations. In August 1949 the Government of India appointed the National Income Committee. Prof. P C Mahalanobis was appointed as the chairman of the National Income Committee.The other 2 members of the committee were Prof D. R Gadgil and Prof V K R V Rao.The main job of the committee was to compile estimates of National Income.The 1st report was submitted in the year 1951.The final report was submitted in the year 1954. This report is considered to be a landmark in the history of India as this is the first time that it provided a comprehensive data of National Income for the whole India. The government established the CSO (Central Statistical Organization) for further estimation of the National income.The CSO regularly publishes the national income. The Gross Domestic Product is the money value of all the goods and services produced within the geographical boundaries of a country in a given period of time. Note: the GDP is only within the country. The GNP is the money value of the goods and services produced by a country in a given period of time Plus Total money value of goods and services produced by the nationals outside the country Minus Incomes received by the foreigners with in the country. Note: The GNP is calculated on the basis of market prices of produced goods, it also includes indirect taxes and subsidies if any. The GNP is equal to GDP if the income earned and received by the citizens of a country within the boundaries of foreign countries is equal to the income received by the foreigners within the country. This is GNP minus depreciation. Note: Both indirect taxes and subsidies are deducted from the NNP. This is actual income obtained by the people after deducting various taxes. PI = National Income – (Corporate taxes + payments made for social security) +Government transfer payments+Business transfer payments+Net interest paid by the government. This is the Personal income minus direct taxes. DPI = PI – Direct taxes. There a 3 methods to calculate the National income.These methods are given by Simon Kuznets. PM (Product Method) or Product service method. CM (Consumption Method) or expenditure method. In India the combination of Product method and Income methods is used for calculating the National Income. NI = GDP – income earned in foreign countries – Depreciation. In the Product method the GDP is taken into consideration.Net income earned in foreign countries is deducted from the GDP.From this the depreciation is subtracted. National Income = Total Rent Plus (+) Total wages Plus (+) Total Interest Plus (+) Total Profit. The total net income of the people working in different sectors and commercial sectors are taken into consideration. The per capita income in India is calculated by CSO (Central Statistical Organization). According the statistics released by the CSO in 2015, the per capita income in the country reached Rs. 88538/- per annum . This is according to the data on current prices. The PMEAC (Prime Minister’s Economic Advisory Council) in the ‘Economic Outlook’ released on August 1, 2011 lowered the economic growth rate projection from 9 percent to 8.2 percent.The PMEAC also reduced the manufacturing sector growth rate from 9 percent to 7 percent. The CSO has included the contributions of all the 3 sectors (Primary, secondary and tertiary) in estimating the National income. The first problem in National Income accounting relates to the treatment of non-monetary transactions such as the services of housewives to the members of the families. For example, if a man employees a maid servant for household work, payment to her will appear as a positive item in the national income. But, if the man were to marry to the maid servant, she would performing the same job as before but without any extra payments. In this case, the national income will decrease as her services performed remains the same as before. Only final goods and services should be included in the national income accounting. But, it is very difficult to distinguish between final goods and intermediate goods and services. An intermediate goods and service used for final consumption. The difference between final goods and services and intermediate goods and services depends on the use of those goods and services so there are possibilities of double counting. The underground economy consists of illegal and uncleared transactions where the goods and services are themselves illegal such as drugs, gambling, smuggling, and prostitution. Since, these incomes are not included in the national income, the national income seems to be less than the actual amount as they are not included in the accounting. There are large numbers of petty producers and it is difficult to include their production in national income because they do not maintain any account. Another problem is whether the public services like general administration, police, army services, should be included in national income or not. It is very difficult to evaluate such services. Individual get pension, unemployment allowance and interest on public loans, but these payments creates difficulty in the measurement of national income. These earnings are a part of individual income and they are also a part of government expenditures. When the market prices of capital assets change the owners make capital gains or loss such gains or losses are not included in national income. National income is the money value of goods and services. Money value depends on market price, which often changes. The problem of changing prices is one of the major problems of national income accounting. Due to price rises the value of national income for particular year appends to increase even when the production is decreasing. Additional payments made in kind may not be included in national income. But, the facilities given in kind are calculated as the supplements of wages and salaries on the income side. The main problem is whether to include the income generated within the country or even generated abroad in national income and which method should be used in the measurement of national income. Inadequate and unreliable statistics; etc. Poverty and Development. Poverty-line and Programmes for eradication of Poverty in India.